Fresh off its global debut at the TFWA World Exhibition in Cannes and Orlando this April Waldemar Behn Superior Premium Vodka, DANZKA THE SPIRIT will be presented to the Asia-Pacific region at the TFWA Asia Show in Singapore. A brand new, totally pure Vodka created on the original traditions of vodka distilling, DANZKA THE SPIRIT was developed by Rüdiger Behn, a passionate fourth generation distiller, together with Timothy Jacob Jensen, Chief designer of Jacob Jensen Design, combining the highest distilling arts with Scandinavian design traditions. Utilizing a traditional long process and the purest ingredients, THE SPIRIT, 44% vol. / 88 proof, has evolved into a perfect taste experience that involves all senses — pure, substantial and slightly grainy – a perfect symbioses of raw wheat and Nordic water naturally filtered. Further emphasizing its super premium positioning, THE SPIRIT is presented in a matte black, sleek, modern evolution of its classic aluminum bottle, created by renowned Danish designer Jacob Jensen Design. Since its launch in October in Cannes, DANZKA THE SPIRIT THE SPIRIT, which is exclusive to travel retail, has been listed with King Power, Dubai Duty Free, Gebr. Heinemann, Dufry, Lotte and Shilla with more to come in the next months. Behn’s Asian travel retail business continued positive in 2016, and the company is enthusiastic about the outlook for 2017. Behn’s main ambition for Asia duty free market in 2017 is to continue to increase the distribution of its core brand DANZKA and launch DANZKA THE SPIRIT throughout the region. The Behn team is present in Singapore at stand B34 / basement 2 to support this expansion. After successful implementing the DANZKA Twinpack and easy to carry 4-bottle-case Waldemar Behn is now introducing the DANZKA mini pack. 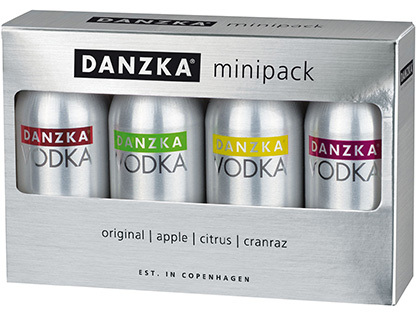 The ideal small traveller´s gift is including a 4 x 5 ml collection of DANZKA original, DANZKA apple, DANZKA citrus, DANZKA cranraz. Responsible drinking is something that we take very seriously. Consequently, the BEHN website is only available to visitors who have reached the minimum age for alcohol consumption as specified by law of their country.